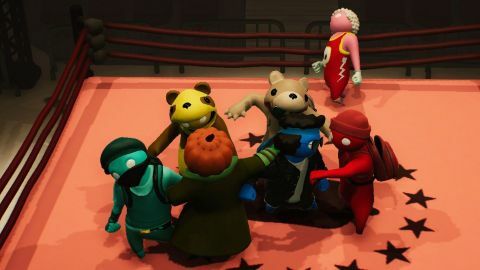 Event favourite Gang Beasts is fleetingly fun, but hardly a multiplayer classic. A one-trick pony of a multiplayer fighter, Gang Beasts is sometimes hilariously messy but often just a mess. Nominally a multiplayer brawler, Gang Beasts could more accurately be described as a slapstick facilitator. Rather than a deep or technical fighting game, it’s more a tool for daft, physics-led pratfalls. In that regard, it’s reminiscent of Coffee Stain Studios’ Goat Simulator. Though Gang Beasts is comfortably the funnier of the two, it’s similarly shoddy and annoying at times. In some ways, it’s not actually a very good game—yet its weaknesses are often the making of it. In case you’ve managed to miss it during its three years in Early Access, or at the dozens of gaming events at which it’s been showcased, Gang Beasts pits a group of wobbly fighters against one another across a variety of compact arenas. Double Fine might claim it’s “in the style of Streets of Rage or Double Dragon”, but it makes those creaky arcade hits look like models of precision and refinement. Boneloaf’s clumsy, tottering avatars are deliberately awkward to control, and the scraps play out like drunken altercations at chucking-out time – all missed headbutts, amateurish grappling and the occasional lucky haymaker laying someone out cold. Though they’re not one-button simple, the controls are intuitive, and offer a broader moveset than you might first think. It’s weirdly hard to land a regular kick, but combine it with a jump at the right time and you can knock an opponent flying. You can throw a left or right jab, but the same buttons can also be used to grab hold of people, railings, cones, girders or ledges. You can even climb walls, releasing your grip with one hand and hitting jump to swing yourself upward—particularly crucial on the Subway stage where you’ll need to clamber back onto the platform before a train arrives. It’s hard to remain grumpy at the physics screwing you over when you’re watching a man with a pumpkin for a head throwing a bear with a rucksack into a meat grinder. In practice, most matches devolve into frantic button-mashing, as you grab and fall over one another, never entirely sure who has the upper hand at any given moment. Amid the flailing arms, legs and heads, one of you will sporadically go limp, but the lack of any real feedback will rarely let you know why. When someone is prone, the race is on to lift them up and throw them to their doom—whether it’s off the side of a building or into an incinerator—before they successfully shake off their concussion. Even when all seems lost, you can enjoy the catharsis of taking your rival down with you by clinging onto an arm or leg as you’re dangling over the edge. The stages present as much of a threat as any opponent. One has giant chutes that open and close beneath your feet; another has collapsing floors; a third puts you all on thin ice floes, forcing everyone to race toward the only solid ground: a bobbing buoy. Trapped within a glass elevator, you can smash the sides or clamber up through a hatch before headbutting the cables and grabbing hold as they snap, sending those still inside plunging to their deaths. Customisable outfits add to the fun: it’s hard to remain grumpy at the physics screwing you over when you’re watching a man with a pumpkin for a head throwing a bear with a rucksack into a meat grinder. Or when a moustachioed penguin atop a runaway truck is smashed in the head by a road sign, accompanied by a resounding clang. All of which makes it a hoot of a local multiplayer game. It’s a giggle with two players, and appreciably funnier with four. But that was true three years ago, and many of the same flaws are still present. Levels have several blind spots—during one online game, I was kicked for inactivity when I survived a fall by clinging onto the back of a building, with no way of seeing where I was to pull myself up. The presentation is bare-bones at best, and the other game types lay bare the game’s fundamental flaws. The infuriating Waves mode pits you against a series of ludicrously capable AI opponents: it took me four games to win a single round, and even that felt like a fluke. The woolliness of the controls and the feeble feedback are harder to forgive when the playing field doesn’t feel level. And while a football mode makes for an endearingly chaotic kickabout, you’ll probably play it a couple of times and not bother again.